My trip to Cuba started in a local bar in Miami with two longtime friends from my military days, who were accompanied by their wives. The next morning I was to fly to Havana on a delegation mission with Code Pink, their second delegation visit this year since the Obama administration announced a U.S. normalization in relations with the Caribbean island nation last December 2014. After several beers and some drinks, it didn’t take long before our discussion turned towards Cuba. The conversation got heated immediately. A typical battle of the narratives about US policy on Cuba took place -which I should be used to by now. Now, Cuba is a hot topic in the Miami area dating back to the Cold War years. Most Cubans who left Cuba during the 1959 revolution settled in Miami. They were mostly of the wealthy class, Cuba’s own one-percenters, who expected that the revolution wouldn’t last. Immediately, Miami became a CIA hotbed for counterrevolutionary activities against Cuba. A little background on US-Cuba relations is important here. Cuba had been a Spanish colony since the 15th Century. By 1898, Cuba’s war for independence had been raging for some years and was coming to a close. Spain was war-weary and the rebels were close to victory. The rebels and the Spanish government were nearing an agreement to end the hostilities and transition Cuba toward independence. At this point, the United States intervened by attacking the Spanish military, defeating their armada in the Caribbean and the Pacific, which ended the war in a matter of weeks. Known in the United States as the Spanish-American War, in this conflict the US would capture and colonize the Spanish territories of Cuba, Puerto Rico, Guam and the Philippines. Under the Treaty of Paris of 1898, Spain ceded its territories to the US. Neither Cuba, nor any of the other territories gained through the war, had any say in the matter. The US established a military government in Cuba, against the wishes of Cubans who soon rebelled. The United States withdrew most of its troops, but not before installing a government friendly to US commercial and strategic interest on the island, in which the Platt Amendment (1901) was added to the newly created Cuban Constitution. Cubans would routinely protest these arrangements in one form or another, and the US would intervene in Cuba militarily in 1906, 1912, and again in 1917. The Platt Amendment gave the US the authority to intervene in Cuban affairs anytime it felt its interest were threatened. The US would also establish a permanent naval base in Guantanamo Bay, Cuba. The arrangement in Guantanamo Bay would latter be cemented under the Fulgencio Batista regime in the 1930’s, which leased the bay to the US Navy indefinitely; only if both parties agree could the Navy withdraw from Cuba. Cuba thus became a neocolony, over which the US was protectorate—able to influence and dominate Cuba’s foreign and domestic affairs, while allowing American corporations to establish monopolies on the island, reaping huge economic benefits. Under the collusion of local elites, who would benefit from this arrangement, Cuba’s wealth would be transferred to US markets, Havana would be a city ran by the American mafia and would become an adult playground for affluent American tourists. But this “playground” had dire consequences for Cubans. 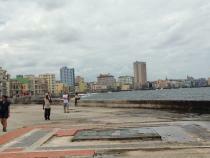 Capital became concentrated in Havana, while the rest of the country fell under neglect. Abject poverty spread widely across the country. These conditions made Cuba ripe for conflict and revolt against this political situation. It was under these conditions that young Cubans would organize, protest, and revolt—which eventually evolved into a revolution. In a nutshell, the US would lose control over Cuba after 1959. The new revolutionary government appropriated land and assets from American companies and the ruling elites, which they promptly nationalized for the purpose of wealth redistribution and national economic development. The Eisenhower administration would slap sanctions on Cuba immediately after the triumph of the revolution. The Kennedy administration followed up with a trade embargo after the failed Bay of Pigs invasion and missile crisis. And in 1996, Congress passed the Helms-Burton Act, enshrining the embargo in domestic US legislation, under which any business, foreign or domestic, would be penalized for doing business with Cuba. The intent was to further isolate Cuba immediately after the dissolution of the Soviet Union and other communist states—which Cuba depended on—in an economic strangulation of the country intended to bring about the downfall of the Cuban government. Washington's strategy for the following 54 years since the triumph of the revolution would be promoting the ouster of the Cuban government and preventing “another Cuba” elsewhere in Latin America. As part of this strategy, the US overthrew democratic governments, backed the most repressive and homicidal right-wing dictatorial regimes, and invaded countries such as the Dominican Republic and Grenada. Cuba, on the other hand, would employ the policy of exporting its revolution to other parts of the hemisphere and beyond, either by supporting violent revolutionary activity, defense of revolutionary governments, or goodwill diplomatic missions like sending technical experts to underdeveloped countries, in part to safeguard its own lasting revolution. Currently, Cuba is one of four states worldwide currently on the US’s “terrorist list,” of countries that it says supports terrorism. It is accompanied on the list by Sudan, Iran, and Syria. In the run-up to the Iraq invasion, in 2002 President G.W. Bush included Cuba in his “Axis of Evil” speech. With the recent thawing of relations between the two countries this year, Obama intends to remove Cuba from the philo-terror list, possibly this coming June (on May 29, the Obama administration announced the removal of Cuba from the states that support terror list), as well as lift much of the travel restrictions to the island. Under the current policy, Americans are banned from traveling to Cuba unless under a special license from the US Office of Foreign Assets Control. The question in many people’s minds about the US new approach towards Cuba is, what would a “thawing” and eventual normalization of relations mean, and what would be its near and long term effects? Would it hurt or enhance the Cuban revolution’s achievements? Will a potential flood of Americans and American business compromise the gains of the revolution? Or, more skeptically, some ask if the US is really changing its strategy towards Cuba, beneath it all. On the last question, it has become evident that the answer is No. The US continues a policy of promoting regime change, although through subtler means. This has been demonstrated by the $20 million budget that continues to go to Cuban dissidents in the hopes of sparking a “color revolution”, the term widely used in the 1990’s to describe the societal transformations and economic restructuring of former soviet and Balkan states, the creation of a Twitter-like social media network known as ZunZuneo for the purpose of sending subversive messaging to Cubans, and by the attempt to co-opt several underground Cuban hip-hop groups with the intent of creating dissent among the Cuban youth. In short, the policy of isolating and the attempt to economically strangle Cuba has been an utter failure for the last 54 years. The embargo can no longer be justified in Cold War terms, or in any terms, for that matter. Cuba has reestablished positive political relations with every state in the Americas except the United States. For more than 20 consecutive years, the United Nations has voted against the embargo that targets the sovereign state of Cuba, which stunts its economic growth and violates its right to self-determination. In essence, the only state here that is politically isolated on this issue is the United States. For further context on Cuba-US relations from pre-1959 to the present, refer to this very informative three-part series on Cuba by RT’s Breaking the Set host, Abby Martin, in which she reports on her recent trip to Cuba in February 2015. Click here, here and here. Columnist and financial expert David William Pear also went on the 150-person Code Pink February 2015 delegation trip, the largest American delegation to Cuba ever. Here’s his analysis on Cuba: click here.